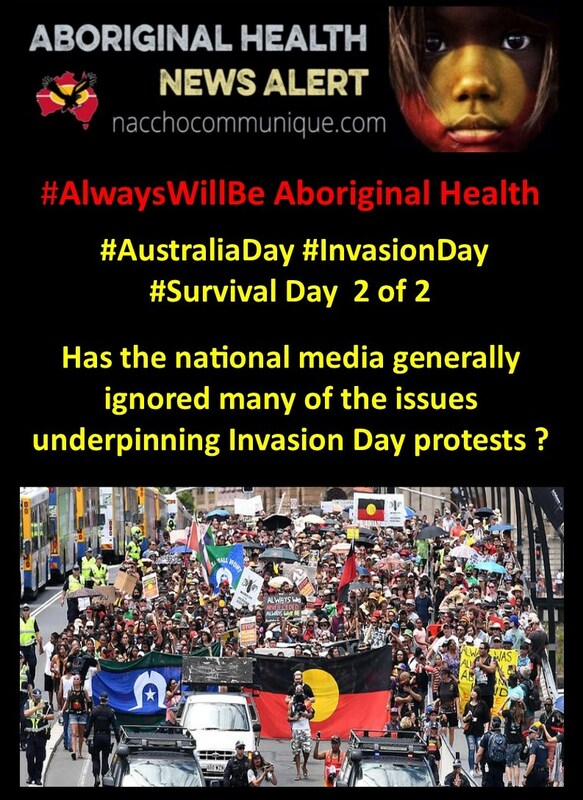 ← NACCHO #AlwaysWillBe #ChangeTheDate Aboriginal Health and #AustraliaDay #InvasionDay #Survival Day A week of programming on @NITV will explore what 26 January means to Indigenous people. “ Negative reporting is commonplace for Indigenous people. A study of more than 350 articles about Aboriginal health, published over a 12-month period showed that almost 75% of these articles were negative. Negative portrayals of Aboriginal health frequently included the topics of alcohol, child abuse, petrol sniffing, violence, crime and deaths in custody. Unfortunately, these are issues that are the everyday reality for our communities, but they are rarely explained in context. There is no explanation of the root of these issues, which is intergenerational trauma caused by colonisation, dispossession, the Stolen Generations, entrenched racism, discriminatory policies and poverty. Every time the media reinforces negative stereotypes it exacerbates prejudice, racism and misconceptions. “It would be really worthwhile if journalists out there came down to our community and tried to talk to our parents, our elders and tried to engage in a meaningful way and tried to find out where Aboriginal people are headed and what we’re trying to achieve. Media is not interested in what makes our people tick, what our people really want, what our people really need. They’re only interested if we’re burning down buildings or knuckling on with the coppers out in the middle of the street. ” Why are white people on Sunrise with no experience calling for Indigenous child removals? Part 1 OPINION: New Today host Brooke Boney cannot address every issue affecting our communities, but this week, she has shown she will not shy away from them went prompted, writes Shannan Dodson. It is 2019, and we are only now seeing the first Indigenous commercial breakfast TV presenter, Gamilaroi Gomeroi woman Brooke Boney. “Brooke Boney” has been trending on Twitter over the last two days as the new Channel 9 Today host offered a perspective not often given by a commercial TV presenter— discussing the hurt and anger associated with celebrating our national day “Australia Day” on 26 January. The Nine Network’s new Today Show reporter spoke out about why she won’t be celebrating Australia Day on January 26. This conversation is not a new one, it’s something our communities have protested about and asked for reflection on for decades. 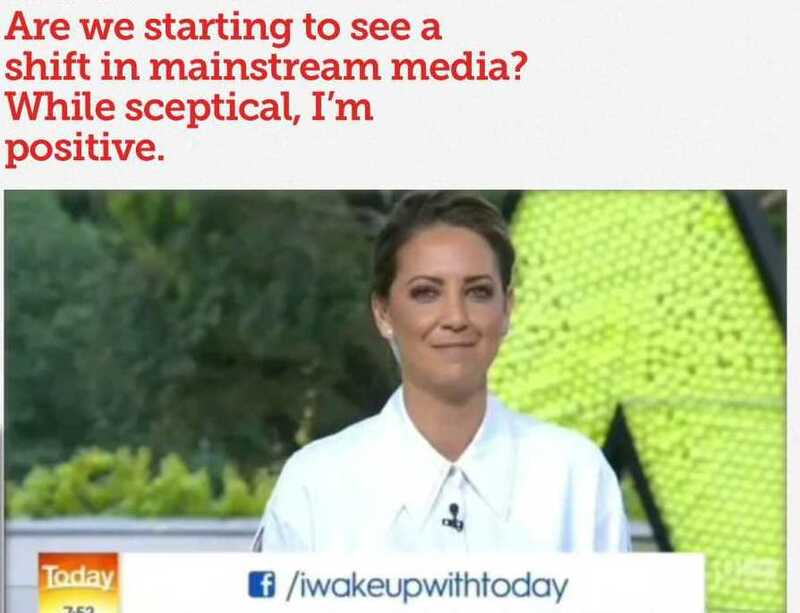 But the fact is that many Australians are not used to seeing this type of commentary on a commercial breakfast show, particularly from an Indigenous person, who is not a guest, but a permanent fixture in the line-up. Many Australians are not used to seeing this type of commentary on a commercial breakfast show, particularly from an Indigenous person, who is not a guest, but a permanent fixture in the line-up. I’m sure many of the viewers heard of Brooke’s appointment, they were hoping that she would steer away from these uncomfortable conversations, and would maintain a level of commentary that doesn’t prod or unbalance the status-quo. While much of the reaction to Brooke’s comment has been positive and supportive, there are of course the people — probably the same people that denigrated Adam Goodes — angry at what she had to say. 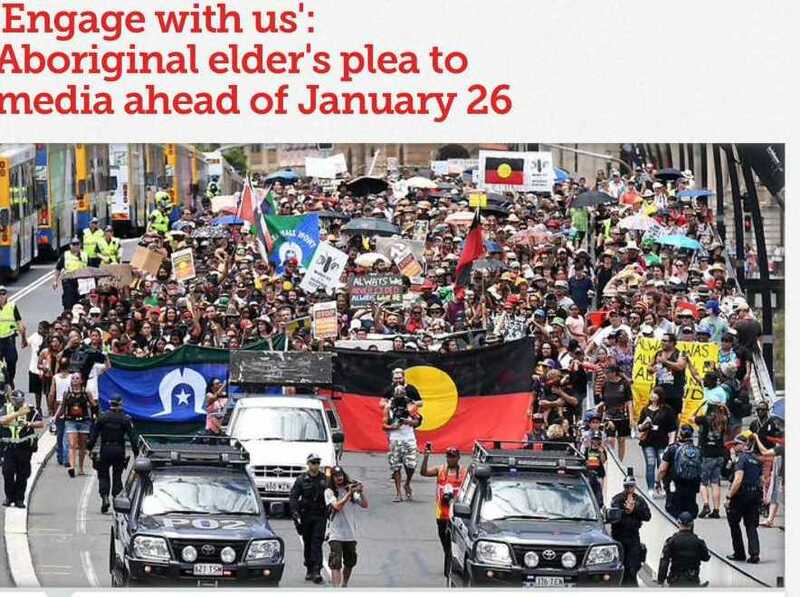 It is difficult to face up to the truth of our history, and for many people to wrap their heads around the link between 26 January, colonisation and the intergenerational trauma we live. And of course, once a minority starts to speak out against the comfortable ignorance this country has sat in for eternity, it is confronting and they are no longer playing their desired role of submissive bystander. Breakfast shows have had ongoing criticism for the lack of diversity in not only the hosts, but guests also. And for not only skirting around Indigenous issues, but being blatantly discriminatory when reporting on them. Brooke is tipping the balance not by just being there, but by speaking her truth. Are we starting to see a shift in mainstream media? While sceptical, I’m positive. Brooke is not going anywhere anytime soon, and while we can’t expect her to address every issue affecting our communities, she has shown that she will not shy away from them. Her presence will lead to more Indigenous people being represented in commercial media, and hopefully more diversity in general. We’ve got to be realistic about the kind of power the media has on public opinion, policy making, politics and social change. Pressure from the media has resulted in Royal Commissions, protests, legislation changes and the list goes on. Media companies, broadcast networks and television programs hold a power we cannot underestimate. Having an Indigenous voice front and centre having these conversations with an audience that may have largely never heard them (or wanted to hear them) is important to the psyche and growth of the nation. With this kind of power, surely the media should reflect the country that it serves. Well, unsurprisingly it does not. The recent census shows that the most common countries of birth in Australia are England, NZ, China, India and the Philippines. But a recent Price Waterhouse Coopers report concluded that 82.7 per cent of the national entertainment and media industry are monolingual, speaking only English at home and on average was a young, white male who lived in Sydney’s eastern suburbs. This is not an accurate reflection of the diversity of backgrounds, cultures, languages, perspectives, and experiences in Australia. Australians turn to the mainstream media to get information, scrutiny and context about news and current affairs. And they are often met with a largely Anglo panel discussing issues they have no knowledge about, without any fair representation and balance. Having Brooke on commercial television — a proud young strong Aboriginal woman —we are giving mainstream audiences, whether they like it a not, a peek into the everyday lives of our communities. Having Brooke on commercial television — a proud young strong Aboriginal woman —we are giving mainstream audiences, whether they like it a not, a peek into the everyday lives of our communities. It is turning those perpetuated stereotypes on their head and countering negative commentary with factual and open dialogue. She is generously and vulnerably giving her perspective — her lived experience — to try and open people’s minds to an alternative way of looking at things than what commercial television has served us over the years. It must only go up from here. Our mob will only continue to infiltrate commercial television stations, and those uncomfortable conversations will hopefully be as commonplace and accepted as the lack of diversity on our screens. Part 2 The media is only interested in Indigenous protests if they’re “burning down buildings”, says a veteran Aboriginal activist. “It would be really worthwhile if journalists out there came down to our community and tried to talk to our parents, our elders and tried to engage in a meaningful way and tried to find out where Aboriginal people are headed and what we’re trying to achieve,” he told NITV News. The Brisbane Elder – who co-founded the Brisbane chapter of the Black Panther Party in the 1970s – said commercial media had generally ignored many of the issues underpinning Invasion Day protests. “Media is not interested in what makes our people tick, what our people really want, what our people really need,” he said. “They’re only interested if we’re burning down buildings or knuckling on with the coppers out in the middle of the street. Mr Watson says it’s important that Australian audiences are getting the full story, in order to better understand Indigenous perspectives. “Australians, because of the enormous pressures of life that we’re living now [and] having to work long hours, they get very little time to absorb the news of the day,” he said.